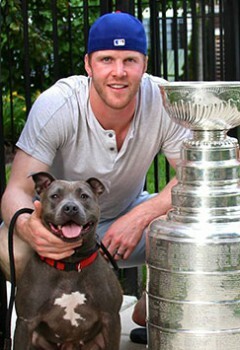 Bryan Bickell was a left-winger for the Chicago Blackhawks and won the Stanley Cup with the Blackhawks in 2010, 2013 and 2015. Bryan and his wife Amanda founded their charity organization, the Bryan & Amanda Bickell Foundation, in 2012 to create awareness for misunderstood dogs labeled “pit bulls”. The organization assists abused children with certified therapy “pit bulls” in their flagship Paws for Strength program. Their most recent program provides fully trained service dogs for those living with Multiple Sclerosis, like Bryan. For more information, visit bickellfoundation.org.